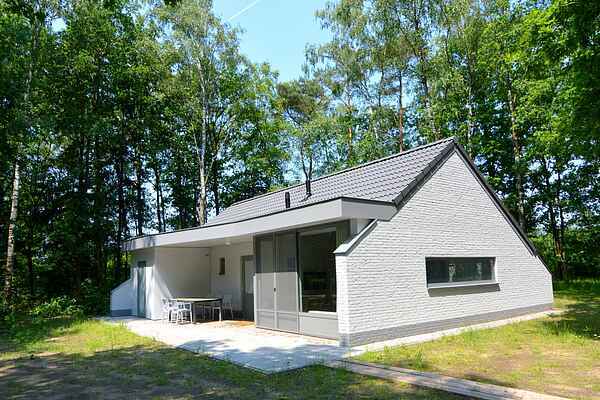 You'll find this small-scale holiday park in a natural area in North Limburg, at the Belgian border, not far from Germany. The park is ideal for young families, you will find a restaurant with large terrace and various playground toys. Nature enthusiasts will also get their money’s worth: the park is situated in the middle of the Kempen-Broek nature reserve, with a large marsh in the centre. This beautiful area is very suitable to be explored by bike or on foot; there are 10 different walking trails. At about 5 km from the park, just over the Belgian border, you'll find Vijvers de Luysen. This is an area with mostly open water, where you can watch many birds from a bird hide. Birds use this area as a resting place when they're migrating south or north. This luxurious detached holiday bungalow is an ideal spot to use as a base for your vacation. The house has a high-quality finish and a design with large windows and a high ceiling to create a spacious impression. You will quickly feel at home here. The holiday bungalow is located in a quiet sport at the back of the holiday park and has a spacious bathroom. You will also find storage to store your bikes safely during your stay. Do you want to do something other than nature for a day? Then go shopping in Roermond with its well-known outlet centre. Or visit the pleasant city centre of Eindhoven. Within an hour you can be in Maastricht, Aachen or Mönchengladbach.